I will meet everyone flying into Jacksonville International Airport at 1pm on Sunday October 11th. Just go outside at the baggage claim and look for a large 15 passenger van, I'll know who you are. For driving directions please call the park at 912-637-5274. If you're going to be in later than 4pm, don’t worry, just let me know. Nothing major is going to happen until Monday. The gates to the park close at sunset. Created in 1937, Okefenokee Refuge covers more than 600 square miles and contains nearly 354,000 acres of designated Wilderness. A number of fresh water springs feed the Refuge, which in turn gives birth to two well-known rivers, the Suwannee and the St. Mary's. Though it may appear flat, the Refuge is actually higher than most surrounding land and its waters, often thought to be stagnant, are in fact continually circulating and flowing in various channels. Though pure and clean, the Refuge's waters are stained dark from the tannic acid in decaying vegetation. Species abundance is breathtaking: black bears, otters, sandhill cranes, ospreys, alligators, bald eagles, yellow-fringed orchids and pitcher plants all find home in the Okefenokee. The swamp contains numerous islands and lakes, along with vast areas of non-forested terrain. Prairies cover about 60,000 acres of the swamp. Once forested, these expanses of marsh were created during periods of severe drought when fires burned out vegetation and some of the top layers of peat. The remaining peat deposits, up to 15 feet thick, cover much of the swamp floor. These deposits are so unstable in spots that one can cause trees and surrounding bushes to tremble by stomping the surface. 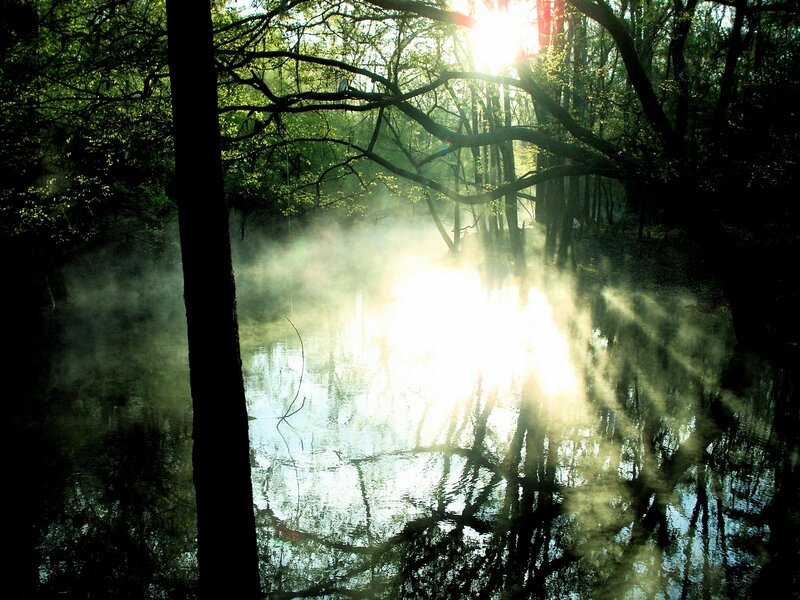 In fact, Okefenokee is a European rendition of the Indian words meaning "land of the trembling earth." Our trip will take us into remote areas of the Okefenokee where we will see cypress forests draped with Spanish moss. We will Kayak across open prairies and along the remains of man-made canals. We will visit Billy’s Island, one of the largest historic logging camps and permanent settlements. It is no longer inhabited, but cement foundations and iron machine parts remain, and show the extent of the logging that once existed. On our last day a local naturalist will guide a wildlife hike. 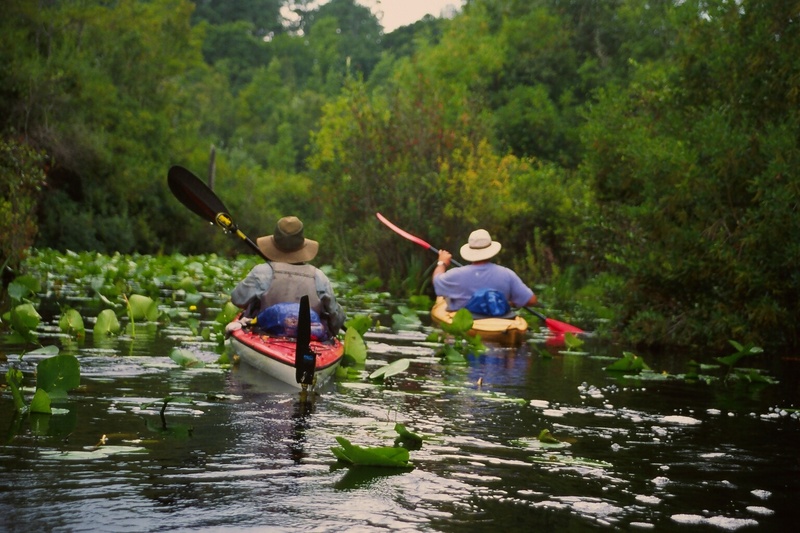 Time permitting our group will also paddle to the headwaters of the mighty Suwannee. Some of the swamp plants and flowers will be blooming and we should see some of the resident sandhill cranes and great blue herons nesting as we paddle around the swamp. The prairies harbor a variety of wading birds: herons, egrets, ibises, cranes and bitterns. Turtles and alligators sunning on logs or on the river banks can be observed at distances determined by the strength of your nerves or the power of your binoculars. The distance we paddle most days will depend on the amount of time we spend viewing swamp creatures and enjoying the solitude. Most days, we will paddle five or six miles round-trip. Going on an additional mile or two is possible, if people choose to do so. There is no public transportation to or within the Okefenokee. The nearest airport is Jacksonville, Florida, at least 60 miles southeast. Participants who fly in will be picked up at 1pm on Sunday the 11th. Folks driving in can call the park for directions and should plan on arriving around 3pm. The parks phone number is 912.637.5274. The leaders will prepare all meals, however, everyone is expected to help clean up. Meals included in the trip fee begin with dinner on the first day and lunch on the last day. Meals served on the trip will honor and reflect local cuisine. A typical dinner would consist of shrimp Creole, white rice, garlic bread, fresh salad, and something chocolate for dessert. Accommodations will be private cabins within the park. Each cabin has two bedrooms with two double beds in each room. Couples will of course get their own rooms, participants coming alone will share rooms.There is also two seperate bathrooms. The cabins have all modern amenities including showers and flush toilets! Please honor Sierra Club policy and leave all electronic gizmos at home, the only exception being cameras. People bringing watches and cell phones will be asked to leave them in storage for the duration of the trip. The Okefenokee Swamp, Franklin Russel, Time-Life Books, 1973. The History of the Okefenokee Swamp, Alexander McQueen, Jacobs and Co., Clinton, SC, 1926.